ProgressTH: Concepts in Synthetic Biology: Environmental Release! Concepts in Synthetic Biology: Environmental Release! If you could create any biological lifeform you could imagine, what would it do if released out into our natural environment? What sort of dangers does such a capability pose to us and what might a future where everyone is a biological designer look like? What sort of measures could we use to not only protect our natural genetic heritage, but protect and isolate our novel organisms? Environmental release (@#%!!!) – setting novel organisms into established ecosystems – is controversial for good reason. Ecological theory and past “invasions” teach us that the outcomes are unpredictable. In the coming era when anyone can design new organisms and set them into the wild, we need to better understand the environmental ramifications. As such, ecologists who model these outcomes have become critical to our future. Since Genspace is a place where people can actually work on creating novel organisms, this most likely is a fear many may have who hear of their work. The course's focus on learning from past "invasions" is very instructive - showing us what works and what doesn't work, and what problems are left over that require new innovations to confront - innovations the advancing field of synthetic biology will eventually offer us. The most obvious solution is to keep synthetic organisms contained in artificial environments and as an added precaution, given attributes that allow them to exist only in these artificial environments. 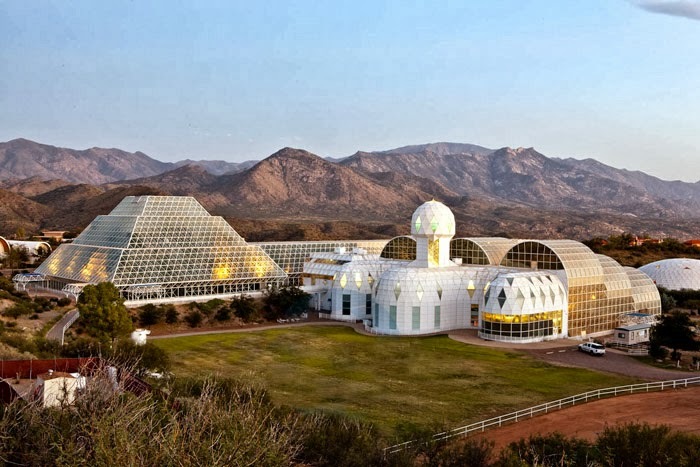 The Biosphere 2 -- an extreme example of environmental containment that could, on varying scales be adapted to protecting both synthetic and natural ecosystems as "living repositories." Artificial environments are nothing new. From the Hanging Gardens of Babylon to the local zoo, humanity has been altering the environment to suit its needs since picking up its first set of tools. Greenhouses and even the humble home aquarium are examples of artificial environments the average person has access to now and could serve as a model to build future containment systems for homemade synBio creations. Interior of a bioshelter -- built onto the side of a house. Another artificial environment readers may not be familiar with is the "bioshelter." This is a greenhouse that is designed as a total ecosystem of elements that work together naturally to maintain a balance and create optimal growing conditions for whatever a user may want. Introduced in the 1970's, designs ranged from small domes in one's backyard or an extension on a house, to a habitat people would literally live inside - including buildings built into a greenhouse like shelter, and even meandering "green tunnels" that would contain a naturally balanced, artificial environment and human inhabitants, regardless of outside conditions. We can easily imagine using bioshelters to create entire synBio ecosystems -- synthetic ecosystems, if you will -- keeping in novel organisms, while keeping out natural and/or synthetic invasive species. A bioshelter could also be used to create natural, living genomic repositories where species amongst our planet's genetic heritage can be isolated from possible contamination, monitored and protected in combination with static and digital genomic repositories. But literal containment infers responsible biological design -- and as many people may already know, not everyone on even the current bioegineering scene is responsible. We can imagine irresponsibility multiplying as the tools and techniques of synthetic biology become more accessible to more and more people. This poses a new set of problems and a new set of proposed solutions. It isn't practical to erect a containment shelter over a natural park. While we may be able to protect our planet's genetic heritage with isolated and protected living, static, and digital genomic repositories, it might not be a good idea to leave the rest of the planet's surface to the effects of novel organisms. In exposed regions we would like to keep in a certain genetic state -- whether that's in a natural or synthetic state -- we will need to develop tools that rapidly sequence, analyze, edit, and reintroduce genes into any given organism. Constant monitoring, similar to that which already occurs on wildlife reserves, could be augmented with sampling organisms for genetic contamination and running them through a process of "genetic recovery" if found to be infected with unwanted genes. Similar to gene therapy, where an organism's DNA is rewritten to eradicate genetic conditions or diseases, genetic recovery would be designed to constantly overwrite the potentially infected genetic code of protected organisms. A process where monitoring, editing, and rebooting is automatic, and only requires spot checking would be ideal. Such tools could also provide people with security against synthetic viruses designed to harm us, or against unforeseen contamination from synthetic organisms. It would also work by identifying genetic contamination in our own genomes and overwriting them with a stored copy of our original genome. Think about information technology and the Internet today. It is a vibrant tapestry of digital environments with plenty of dangers, but with a surprisingly functional balance struck between would-be trouble makers and the rest of society simply seeking to work, communicate, learn, and be entertained. There are regions that are known to be dangerous, others that are accessible but actively monitored and protected from harm, and others still that are totally contained and protected. On a more technical level, when a single computer is infected, several steps can be taken to fix it. 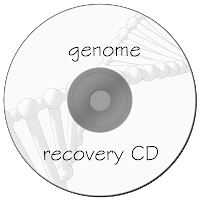 In the worst case scenario, we have a backup "recovery CD" with the ever-essential operating system we can use to overwrite our hard drive with and start over again. We (should) have backups of all our files just in case things go wrong. What some may imagine as a total disaster waiting to happen often ends up being an inconvenience at most. We can see the obvious parallels between these existing aspects of information technology, and their proposed counterparts across the emerging field of synthetic biology. While people fear the worst regarding an "environmental release!" the reality is most likely going to resemble our existing IT infrastructure. We will be able to preserve our natural genetic heritage and explore the possibilities, benefits and potential pitfalls of future synthetic ecosystems - with relative safety if we develop the proper tools and techniques to manage the risks involved. Most important of all to allay fears is to ensure people are educated in all aspects of synthetic biology and given access to the tools of this new trade. People will realize the double-edged nature of this technology, and play a direct role in ensuring the technology is used responsibility and in the best interests of themselves and their communities instead of fearing and obstructing it. Check out previous "Concepts in Synthetic Biology:"